Imagine if I asked you to take a ride in my 2-year-old son’s favorite sports car and ultimate luxury vehicle, the Lamborghini Aventador…cherry red. Costs about $400K, has 720 horse-power, and goes zero to sixty-mph in 2.8 seconds. I’m drooling just thinking about it. What if I also told you it had no brakes. The manufacturer just “forgot” to install them. If you know I have a lead foot, then would you still want a ride? I tell my hitters that someone like Matt Kemp or Ted Williams are using both rotational and anti-rotational systems during the swing. How to tune-up your acceleration & braking system. Thomas Myers in his book Anatomy Trains talks about 9 different fascial lines found throughout the body that inter-weave and inter-relate during human movement. We’ll be highlighting one in particular called the Functional Lines (pictured right). 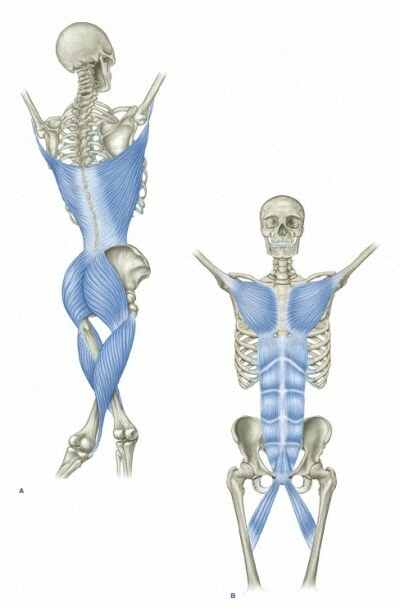 CLICK HERE for a brief background on springy fascia. Follow yellow arrows tracking Ted Williams’s front (right) shoulder path…photo left to right: 1) Down, 2) Up, and 3) Down again. Follow yellow arrows tracking Matt Kemp’s front (left) shoulder path…photo left to right: 1) Slightly Down, 2) Up, and 3) Up again. Focus on finishing “barrel down” with his top hand release. Engage BFL (Alternating Supermans) – 2 sets X 12 reps each side. Focus on moving the body as a whole. Arm and leg are to be lifted at exactly same time. Head stays in line with spine. Don’t arch head back like in video. Engage FFL (Alternating Supermans) – same as #1, but do Alternating Supermans on your back. Stretch BFL (Triangle Yoga Pose) – Hold position on each side for a deep breath count of 5-10. Stretch FFL (1/2 Kneeling Hip Flexor Stretch w/ Rotation) – hold position on each side for about 60-seconds. Keep the abs and “down knee” glute contracted during stretch. Do the above four 1-2 times daily for 3-weeks. 1) You description of ‘barrel down’ at finish is perfect – my local ‘pros’ can’t figure this out. 2) Ted Williams hips are awesome – that relates the Chas’ superthrust – Do you have any comments on how that could generate more power for Kemp without any sacrifice? Steve, I know the one-handed release came about through the Charlie Lau philosophy. I always liked the way it made me feel like I was getting through the ball. As long as this kind of hitter understands that the barrel must finish low, they optimize the finishing movement (braking system). Aside from Kemp not being as efficient with his Accel/Brake Systems, he arm bars as well. The “super-thrust” thing has to do with bending the back knee during the Final Turn. By “skipping” the back foot slightly forward during the turn, Kemp will get a better pitch-plane angle, better hip turn, and keep the head still. What’s scary is Kemp has an over .350 Batting Average on Balls In Play (BABIP) after 9 years of MLB experience. This loosely measures how hard a hitter hits the ball. I think the elements I mentioned in the video/blog post will significantly boost his repeatable power. I hope this answers your questions Steve. Ted Williams is my B-O-A-T, in my opinion if you’re following the best, disregarding several others isn’t all bad. Along that same thought and what he says in his book, unless you’re Mickey forget the other side, imagine the work you double on the dominate hand without switching. I’ve wondered why Ruth, DiMaggio, Williams all looked like a twisted washrag on follow through. You’ve put it in perspective for me here. I had to do it in order to think about it. It seems that the one handed follow through creates the high back shoulder. A ton of pros to kids use it. When I kept both hands on it made the high front shoulder simple. When you freeze with the high back shoulder and slowly transition to a high front, there’s about 6 inches of swing left. I immediately worried about the outside pitch however. Turns out you can still get to it by doing what I call ‘following the ball with your hands’ into the two-handed, high front shoulder. (I harp on my kid about keeping both hands on the bat, a lot disagree.). The question for me remains, how much impact does the follow through have on a batted ball? (We’ve all seen Fraizer hit it out with no hands, and Harper break a bat and it still fly out of the ballpark.). Maybe you or Sports Science can do a piece on it. 😉 Great realizations here, thank you for the post! My pleasure Bill, and you raised a lot of great points here. I don’t teach all my hitters to a 2-hand finish, but I do encourage it. Fixes quite a few things that can be thorns on the journey to an effective swing. Physics says a hitter can let go of the bat just before impact, and nothing changes with force production. However, biomechanics says directional force matters. A 2-handed finish helps with the latter, and like you said helps to safely decelerate the spinal engine and springy fascia.